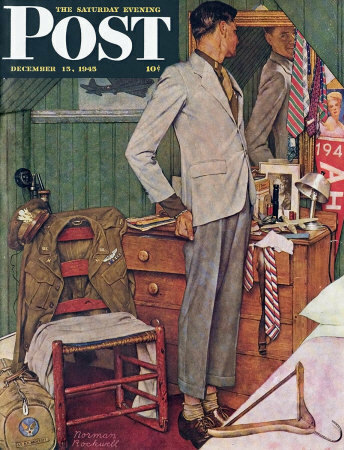 Back To Civies, a Norman Rockwell painting, appeared on the cover of The Saturday Evening Post published December 15, 1945. This is another favorite of Rockwell collectors, a classic enduring image of the world Rockwell painted. An alternate title for this painting is Man on Outgrown Clothes. This painting was Rockwell's 235th overall out of 322 total paintings that were published on the cover of the Saturday Evening Post. Rockwell's career with the Post spanned 47 years, from his first cover illustration, Boy With Baby Carriage in 1916 to his last, Portrait of John F. Kennedy, in 1963. This was also the ninth cover for The Post in 1945. In 1945, there were ten Norman Rockwell Saturday Evening Post covers published. The original oil on canvas painting. 30 x 39.5 inches or 76 x 100.5 cm, is part of the collection of Steven Spielberg and appeared in the Smithsonian exhibit, Telling Stories: Norman Rockwell fron the Collections of George Lucas and Steven Spielberg . One study also appears in the Norman Rockwell Catalogue on pages 162. In this painting, Norman Rockwell explores the dilemma of coming back from war as a man after leaving as a boy. This was probably a common predicament since many boys could hardly wait to sign up to go to war. No doubt many filled out and grew taller while in the service. This painting shows how Lt. A. H. Becktoft grew during his service to his country. We know his name because it appears on the duffel bag on the floor. Becktoft was a war hero, piloting a Flying Fortress during the war. His insignia on the uniform jacket tells us that Becktoft served with distinction. The blue and yellow ribbon with the tiny oak leaf cluster means that he received the Air Medal twice while he was in the service. The room appears to be his bedroom before he went off to war. It appears to be an upstairs room, judging by the slope of the walls. His pants are now too short and so is his jacket. We can also see that his uniform shirt sleeve hangs way lower than his old jacket sleeve. His facial expression reflected in the mirrror suggests amusement. Back To Civies was only one of 322 Norman Rockwell Saturday Evening Post covers; Here is the list of Norman Rockwell Saturday Evening Post cover illustrations. For this painting, the room was arranged exectly like Rockwell. Rockwell often staged his backgrounds. This composition suggests elements of the pilot's life both before he joined the Air Corps and after. Do you have any ideas about Back to Civvies? Please feel free to mention your opinions below. Do You Have A Great Story, Opinion Or Contribution About Back to Civies?